NetPlanner employees are helping to keep their local community clean through Adopt-A-Road. 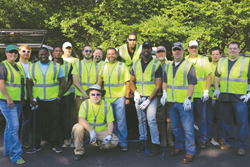 NetPlanner Systems, Inc., recently adopted a section of roadway as part of the Gwinnett Adopt-A-Road program, sponsored by Gwinnett Clean and Beautiful and the Gwinnett Department of Transportation. This litter prevention program enables citizens to show their pride in Gwinnett and safely reduce the amount of unsightly trash and illegal signage alongside county roadways.